Give Back to Our Warriors this Holiday Season! As we enter the holiday season, we encourage you to join us in giving back to the service members who have sacrificed so much on our behalf. Learn more in our first article. 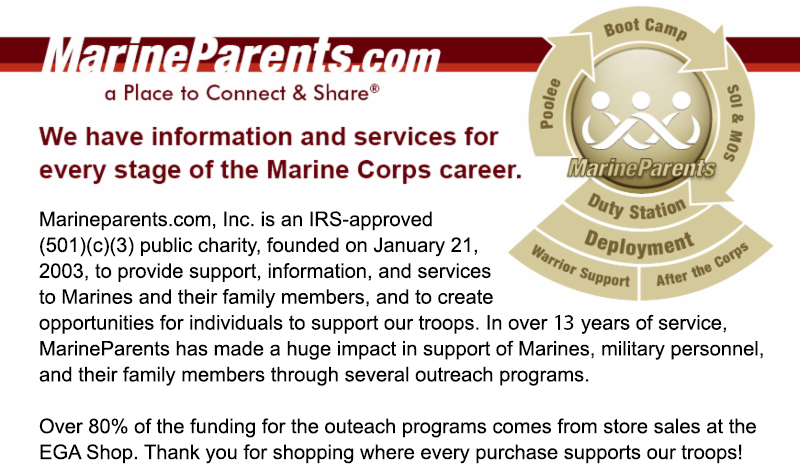 After five years of dedicated service to MarineParents.com’s East Coast Warrior Support Team (previously Purple Heart Hero Support) outreach program, one of our longest-serving volunteers, Gail Chapman, will be parting ways with MarineParents.com. 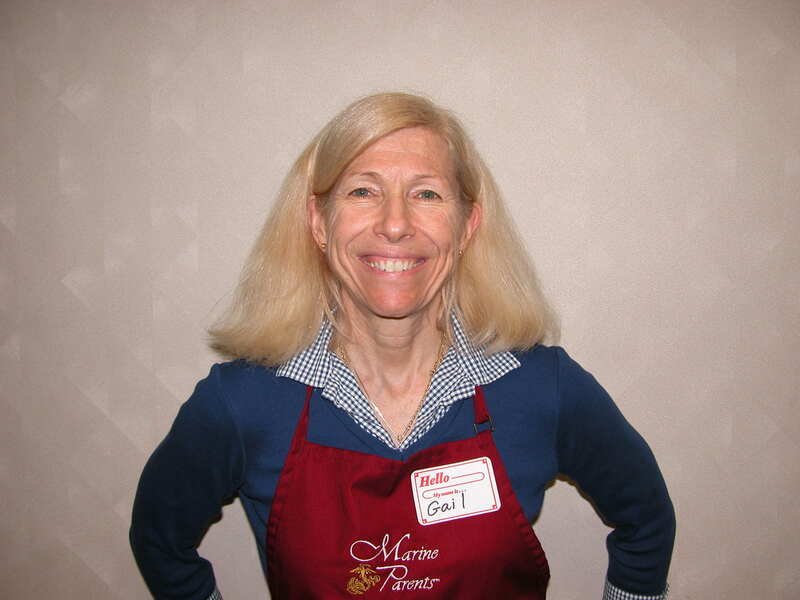 Gail began volunteering with Marine Parents in 2010 after a friend introduced her to the organization. 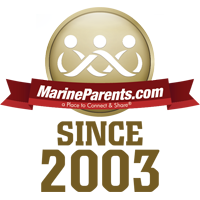 One of Gail's favorite aspects of the time she spent volunteering with Marine Parents is, "Feeling as though you are giving back to those that have sacrificed so much. I like the smiles, the interactions, the genuine appreciation and, of course, the fellowship of our volunteers." 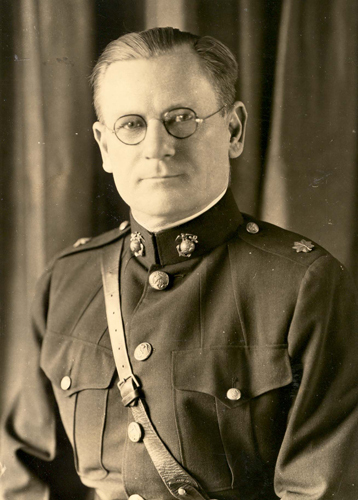 While the true origin of the term "oorah" may never be known, a number of historical sources argue that it can be attributed to the eighth Sergeant Major of the Marine Corps, John Massaro. 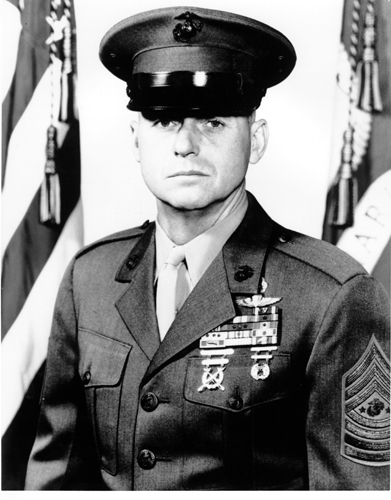 According to this theory, Massaro introduced the phrase to Marine recruits during his time as a drill instructor in the mid-1950s following his time with the 1st Marine Division Reconnaissance Company during the Korean War. In the decades since, the term has become a battle cry and an indelible part of Marine Corps lexicon, alongside words and phrases such as "leatherneck," "devil dog," and "first to fight." More than three decades after leading the push to get the Vietnam Veterans Memorial built, Army veteran Jan Scruggs is now advocating the construction of a memorial for post-9/11 veterans. In order for a memorial to be built on the National Mall, Congress will have to overturn the 1986 Commemorative Works Act, which stipulates that work on a war memorial cannot begin until 10 years after that war has ended. According to Scruggs, the act is out of touch with modern warfare against terrorism, which won't have a clear-cut ending. This Tuesday, November 10, 2015, saw Congress approve a "historic" overhaul of the military retirement system. The more-than-$600 billion National Defense Authorization Act (NDAA) bill will modernize the 70-year-old military pensions and extend retirement benefits to include the more than 80 percent of troops who now leave the service with no pension, according to Senator John McCain (R-Ariz). The Marine Corps Times has recently released its annual list of best colleges and universities for military veterans. The schools were divided into three different categories: Two-year schools, four-year schools, and online/non-traditional schools. 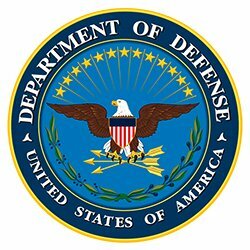 The rankings are based on the results of and feedback from a 120-question survey and, "...d ata from the Veterans Affairs Department, Defense Department, and three Education Department databases for information on everything from veteran-related policies to average salaries after graduation." 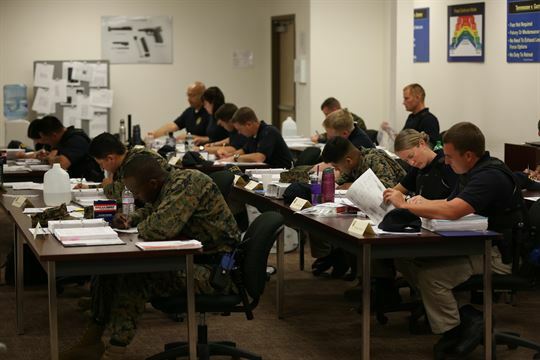 *Image info: Marine and civilian students review their work together in the same classroom aboard Marine Corps Air Station Miramar, California. (official USMC image). Twenty-five years ago this week, on November 8, 1990, President George H.W. 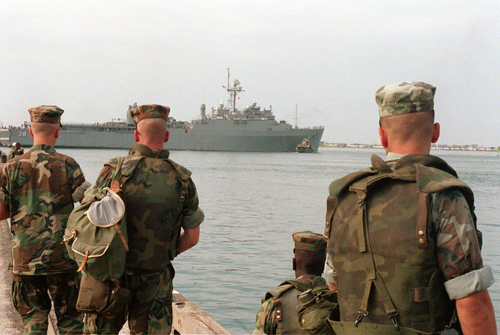 Bush announced his plan to add more than 200,000 additional troops to those already deployed to the Persian Gulf area in support of Operation Desert Shield. With the addition of II MEF units from the Marine Corps' East Coast bases, and the 5th MEB from California, the number of Marines deployed to the area swelled to nearly 90,000 within two months. Ninety-four years ago this week, November 10, 1921, marks the date of the first formal celebration of the Marine Corps' birthday as November 10. On October 21 of that year, Major Edwin McClellan sent a memo to then-Commandant of the Marine Corps, John A. Lejeune, proposing that the original date of the founding of the Marine Corps, November 10, be declared a Marine Corps holiday to be celebrated by Marines across the globe. Less than two weeks later, on November 1, Commandant Lejeune issued Marine Corps Order No. 47 summarizing the history, mission, and tradition of the Corps, and directed that it be read to all Marine commands each year on November 10. *Image info: Edwin McClellan (Official USMC photo). 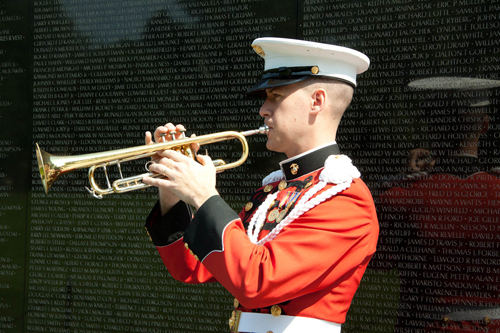 Thirty-three years ago this week, on November 13, 1983, the Vietnam Veterans Memorial, containing the names of more than 13,000 Marines who lost their lives in Vietnam, was dedicated during a ceremony in Washington, D.C. 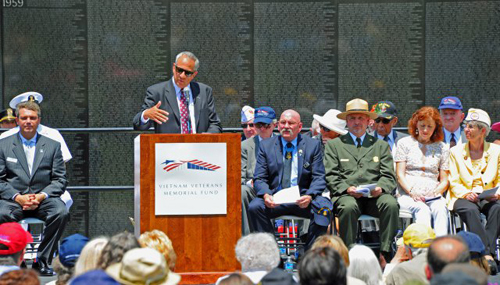 The dedication, and the parade preceding it, were part of a week-long salute to veterans of the Vietnam War.